WASHINGTON (AP) -- Less than a month into his tenure, Donald Trump's White House is beset by a crush of crises. Divisions, dysfunction and high-profile exits have left the young administration nearly paralyzed and allies wondering how it will reboot. The bold policy moves that marked Trump's first days in office have slowed to a crawl, a tacit admission that he and his team had not thoroughly prepared an agenda. Nearly a week after the administration's travel ban was struck down by a federal court, the White House is still struggling to regroup and outline its next move on that signature issue. It's been six days since Trump - who promised unprecedented levels of immediate action - has announced a major new policy directive or legislative plan. His team is riven by division and plagued by distractions. This week alone, controversy has forced out both his top national security aide and his pick for labor secretary. "Another day in paradise," Trump quipped Wednesday after his meeting with retailers was interrupted by reporters' questions about links between his campaign staff and Russian officials. Fellow Republicans have begun voicing their frustration and open anxiety that the Trump White House will derail their high hopes for legislative action. Sen. John Thune of South Dakota demanded Wednesday that the White House "get past the launch stage." "There are things we want to get done here, and we want to have a clear-eyed focus on our agenda, and this constant disruption and drumbeat with these questions that keep being raised is a distraction," said Thune. Sen. John McCain of Arizona blasted the White House's approach to national security as "dysfunctional," asking: "Who is in charge? I don't know of anyone outside of the White House who knows." Such criticism from allies is rare during what is often viewed as a honeymoon period for a new president. But Trump, an outsider who campaigned almost as much against his party as for it, has only a tiny reservoir of good will to protect him. His administration has made uneven attempts to work closely with lawmakers and its own agencies. Officials have begun trying to change some tactics, and some scenery, with the hope of steadying the ship. The White House announced Wednesday that Trump, who has often mentioned how much he loves adoring crowds and affirmation from his supporters, would hold a campaign-style rally in Florida on Saturday, the first of his term. The event, according to White House press secretary Sean Spicer, was being "run by the campaign" and it is listed on Trump's largely dormant 2016 campaign website. No other details were offered. To be sure, pinballing from one crisis to the next is not unprecedented, particularly for a White House still finding its footing. But the disruptions that have swirled around Trump achieved hurricane force early and have not let up. On Wednesday his choice for labor secretary, fast food CEO Andy Puzder, withdrew his nomination while the administration continued to navigate the fallout from the forced resignation of national security adviser Michael Flynn. Flynn was ousted on the grounds that he misled the vice president about his contacts with a Russian ambassador. Flynn's departure marked the return of an issue Trump is not likely to move past quickly. The president's relationship with Moscow will continue to be scrutinized and investigated, sometimes apparently fueled by leaks from within his own administration. Trump on Wednesday blasted what he called "illegal leaked" information. Not just leaks, but also legal woes, have derailed Trump's early efforts. After the 9th U.S. Circuit Court of Appeals rejected his immigration ban last week, Trump emphatically tweeted "SEE YOU IN COURT!" and the administration vowed that it would re-appeal the block and either revise its original executive order or write a new one from scratch. But confusion soon followed. After first indicating they would not take a temporary restraining order to the Supreme Court, administration staffers squabbled audibly, behind closed doors, over the accounts emerging in news reports. When the dust settled, a new statement was printed out and handed to journalists, stating, "to clarify," that all options were on the table. But despite Trump's vow to have a plan in place by Tuesday, one has not emerged. The collapse of the ban, which poured fuel on simmering staff rivalries, was followed by a period of stark inaction by a White House suddenly put on the defensive. 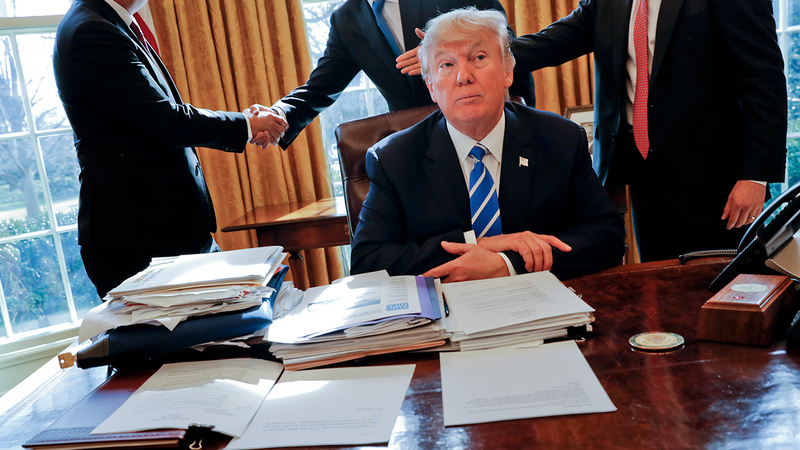 Trump did sign legislation Tuesday that rolled back a financial regulation, but his administration has not issued any executive orders in days. House Republicans have been nudging the White House to get behind Speaker Paul Ryan's tax overhaul, which includes a border adjustability plan of which Trump has been skeptical. GOP aides believed they were making progress, but the matter has been overshadowed by the flood of controversies. Other possible executive actions have been bandied about, from a task force on allegations of voter fraud to steps to strengthen cybersecurity, but have yet to be released. Key legislative items such as a massive plan to rebuild roads and bridges and an overhaul of the tax law remain works in progress. "He's a one-man band for all practical purposes, it's how he ran his business," said Bill Daley, a former White House chief of staff under Obama. "When you try to take that and everything revolves around that and he is the beginning, middle and end of everything, that is a tough model. His campaign was the same way." Trump's new administration has also been plagued by ethics brushfires that are taking up the time and energy of communications and legal staff members. In one incident that sparked bipartisan condemnation and calls for ethics investigations, White House counselor Kellyanne Conway said on TV that people should "go buy Ivanka's stuff" - an endorsement that came after the president disparaged Nordstrom for dropping his daughter's fashion line. And congressional Republicans also are demanding to know more about the security measures in place at Mar-a-Lago, Trump's weekend White House, where resort members photographed him during a dinnertime national security strategy session after North Korea launched a missile. "When you are the White House, every day is a crisis. Crisis is routine," said Ari Fleischer, who was President George W. Bush's first press secretary. "But when they all come right on top of each other, particularly at the start of an administration, it starts to create the feeling that they don't know how to run the place." Additional reporting contributed by Julie Pace, Erica Werner, Ken Thomas, Vivian Salama and Julie Bykowicz.